Do you live in Durban? Holt and Partners T/a Er Consulting Inc (Netcare Alberlito Hospital) Reviewed by: Selma Takacs 17 March 2019. Thank you to the ER team. They were amazing! Danco Engineering Cc Reviewed by: John A Don't pay their accounts and don't return calls or answer their phone. Durban (Zulu: eThekwini, from itheku meaning 'bay / lagoon') is the largest city in the South African province ofKwaZulu-Natal. It is also the second most important manufacturing hub in South Africa after Johannesburg. It forms part of the eThekwini metropolitan municipality. Durban is famous for being the busiest port in South Africa and Africa. It is also seen as one of the major centres of tourism because of the city's warm subtropical climate and extensive beaches. The municipality, which includes neighbouring towns, has a population of almost 3.5 million, making the combined municipality the biggest city on the Indian Ocean coast of the African continent. The metropolitan land area of 2,292 square kilometres (885 sq mi) is comparatively larger than other South African cities, resulting in a somewhat lower population density of 1,513 /km2 (3,920 /sq mi). Zulu evidence from the Drakensberg mountains suggests that the Durban area has been inhabited by communities of hunter-gatherers since 100,000 BC. These people lived throughout the area of present day KwaZulu-Natal until the expansion of Bantu farmers and pastoralists from the north saw their gradual displacement, incorporation or extermination. Little is known of the history of the first residents, as there is no written history of the area until it was sighted by Portuguese explorer Vasco da Gama, who sailed parallel to the KwaZulu-Natal coast at Christmastide in 1497 while searching for a route from Europe to India. He named the area "Natal", or Christmas inPortuguese. Historical architecture in Durban; Durban City Hall. The modern city of Durban dates from 1824, when a party of 25 men under British Lieutenant F. G. Farewell arrived from the Cape Colony and established a settlement on the northern shore of the Bay of Natal, near today's Farewell Square. Accompanying Farewell was an adventurer named Henry Francis Fynn. Fynn was able to befriend the Zulu King Shaka by helping him to recover from a stab wound he suffered in battle. As a token of Shaka's gratitude, he granted Fynn a "30-mile strip of coast a hundred miles in depth." The Durban Metropolitan Area (DMA) has a large and diversified economy with strong manufacturing, tourism, transportation, finance and government sectors. Its coastal location and large port gives it comparative advantage over many other centers in South Africa for export-related industry. Durban's subtropical climate, warm marine current and culturally diverse population has drawn in tourists. Durban remains the third richest city in South Africa. The city has revitalised its inner areas with the new Durban Point Waterfront development south-east of downtown sporting uShaka Marine World and many new residential and leisure developments. It is hoped efforts by the city to clean up the business district, new developments in Point and the 2010 FIFA World Cup stadium north of the CBD (Moses Mabidha Stadium) will aid in the economic turnaround. In 2010 Durban was rated a Gamma level Global City. Natal cotton field (Durban, South Africa) (c.1885). 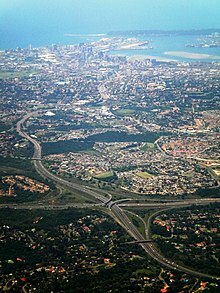 The Durban Metropolitan Area is the main economic driver in KwaZulu-Natal, contributing over half of the province's output, employment and income. In national terms, Durban is the second most important economic complex after Gauteng, accounting for 15% of national output, 14% of household income and 11% of national employment. Regional development corridors link Durban northwards to Richards Bay and Maputo, and westward to Pietermaritzburg and Johannesburg. It is one of the main tourist attractions in the Durban area. The wide stretch of golden sands, artificially separated by various piers, provides excellent opportunities for sun-worshippers and swimmers to enjoy the sub-tropical sunshine and warm waters of the Indian Ocean. Most of the Mile's beaches are protected year-round by lifeguards and shark nets. The Mile is also a well-known surfer's haven. The South Beach end, in particular, is well known as a safe beach for neophyte surfers. The beachfront properties are a mix of residential apartments and tourist hotels, development of which boomed in the 1970s, although remnants of Durban's art-deco architecture are still evident. Interspersed among the beachfront properties are several popular restaurants and nightclubs. Victoria Embankment - The Victoria Embankment (also known as the Esplanade) is home to many tourist sites. International Convention Centre – the leading conference centre in Africa for the last 5 years, and rated 4th in the world in 2005.
uShaka Marine World ( uShaka Marine World ) - one of the largest aquariums in the world. Sahara Stadium Kingsmead - is a major test match and one-day cricket venue. Kings Park Stadium (previously known for sponsorship reasons as ABSA Stadium) is host to the internationally renownedSharks Rugby Team. Greyville Racecourse - (home of the Durban July Handicap) and Durban Country Club and golf course.